"Pumpkin Harvest Time in Mapleton"
Here it is, my first autumn painting of the year. I listed it on eBay this evening. You can check it out here. Pumpkin harvest time has arrived in Mapleton. After a long day of gathering pumpkins and arranging autumn displays in the barn for the first day of the annual "Fall Festival", the Greenway family has retired early. They will rise at the crack of dawn to meet their first customers with freshly baked pies, breads, muffins, cookies, and their specialty "pumpkin donuts". The scent of freshly brewed coffee and warm apple cider will greet the customers as they browse among the pumpkins looking for the perfect specimen. I realize that it's not a good idea to rush the seasons, but I'm always ready for the next one a month or two before it's time. I love the scent in the air, the crunch of the leaves beneath my feet, and the food!!!!!! Oh the wonderful food that cooler weather brings with it. Soups, baked goodies, pumpkin anything........... Sorry I'm drooling on my keyboard. I'm ready to start another autumn or winter painting to stay in the zone! I can't wait for Fall, it's my favorite! Ahh....my favorite time of year! 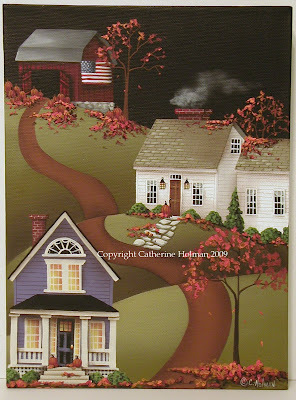 Cathi-I love this painting! Oh heck I love all your paintings!! With Autumn right around the corner, what better way to start the Fall season with a Fall painting of yours! Oooooo, love this! I'm ready for Fall. It is beautiful! Fall is my favorite time of year. Aaahhhh Fall!! Thank you Catherine. 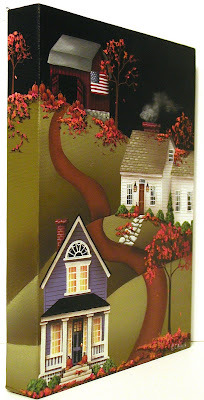 Catherine, I love your new autumn painting, it is so charming and pretty. Thank you for the touch of autumn! It is, by far, my favorite time of the year! It always fills me with anticipation and joy. I adore the new painting! It is so lovely! Oh I'm so glad you posted an Autumn painting! ONe of my favorite seasons! Last year I got one of your fall prints and I can't wait to put it out again at the cabin. I love to paint but I have never been interested in Prim until I checked out your blog. Your work is beautiful - very clean. I will keep checking back to see what you will be doing next. I love to look at your paintings and with the pace that we all seem to keep it makes me want to jump into one of them and hang out for awhile. Cathy, this is so beautiful! It won't be long until we'll be experiencing the real thing! It's very pretty. The first pic you posted, which showed the sides of the canvas, made me think it was used as a book jacket. But I'm pretty sure that it would really make an excellent and most attractive jacket, if it were used for that purpose. Love the balance, serenity, and the colors. Your strokes are so fine and the whole composition, well-balanced with a clean, structured feel to it.